The main goal of this procedure is to support the correct use and management of LASER equipment belonging to different classes in various areas of application, for the purposes of safety, with the aim of preventing risk from exposure to radiation emitted by a LASER system, both for the operators and for all categories of people potentially exposed. The Directive 2006/25/EC prescribes that the methods applied in the assessment, measurement and/or calculation of LASER radiations shall follow the International Electrotechnical Commission (IEC) standards. The main legal reference on LASERs is the technical framework standard IEC/EN 60825-1, with which the manufacturer shall comply for the purposes of CE marking. This procedure is based on the above mentioned standard and allows the employers and the operators, that do not have the appropriate knowledge in the field of LASER, to identify the correct conditions of use and installation of a LASER system; at the same time, it allows to identify, in a completely independent manner, the conditions of use that are not compliant or inappropriate, without the help of technical specialized personnel; furthermore, this procedure facilitates the purchase and the choice of new machineries, taking into account also the requirements for the installation rooms, depending on the type of LASER that will be installed. The procedure is targeted in particular to Class 3B and 4 LASERs, due to the increased hazard and management complexity associated with these devices. The IEC/EN 60825-1 standard describes the different LASER classes and the Nominal Ocular Hazard Distance (NOHD), namely the distance over which the beam does not determine any damage to the eye. The standard prescribes the obligation for the manufacturer to provide the NOHD, if this is relevant for safety management purposes. This parameter, which is of paramount importance for high risk classes, can be used as a starting point for the appropriate safety management of the device: depending on the distance at which the LASER is capable of causing a damage, one can decide which prevention and protection measures to put in place: if the NOHD is only a few centimetres, the use of appropriate personal eye-protection equipment by the operator will be enough; vice versa, in those cases where the NOHD is some meters long, it will be necessary to delimitate a totally isolated controlled access environment with interlocks, inside which the LASER system can be used (Laser Controlled Area), with the mandatory obligation to wear appropriate PPEs for all within this area. For the essential information concerning the correct assessment of LASER risk and the requirements for the environment where the LASER is used, one can refer to IEC-TR 60825-14 “A User Guide”. The standard IEC 60825-4 specifies the requirements for the laser guards used to enclose a LASER source. The requirements for the personal eye-protection equipment are stated in the standards EN 207 and EN 208. It shall be reminded that in Italy, when a class 4 LASER is used, the appointment of a Laser Safety technician (or a Laser Safety Officer, in the hospital setting) is mandatory. This professional shall have the competences required to manage all the safety aspects for the LASER system used in the company and shall be able to implement the indications provided by the manufacturer of the device, to identify the requirements of the LCA (if required) and the modes of access to it, to verify the compliance of the personal eye-protection equipment with the requirements stated in the Owner's manual of the device, to write the safety regulations, to verify the persistence of the safety requirements and to monitor the correct use of the apparatus by the personnel. The signs to display at the entrance should include those indicated by the manufacturer in the Owner's manual. Access panel: part of the protective housing or enclosure that allows access to LASER radiation when it is removed or displaced. Administrative and procedural controls: safety measures of a non technical nature, such as supervision methods, safety training of the personnel, warnings and controls on the safety zones. Aperture: Any opening of the protective housing of the LASER equipment through which the LASER is emitted, thus allong the access to this radiation. Beam attenuator: a device that reduces the LASER radiation to a value at or below a given level. Beam stop device: device that interrupts the path of a LASER beam. Continuous Wave - CW: a LASER that delivers power continuously, for a duration equal to or higher than 0,25 sec; it is considered as a continuous emission laser. Device with an embedded LASER: indicates a LASER device, which, following technical adaptations limiting the accessible emissions, has been assigned to a lower class compared to that corresponding to the characteristics of the embedded LASER, i.e. the LASER enclosed inside the device. E.g. an industrial LASER for metal cutting belonging to class 4 which is enclosed in a completely closed device in such a way that the device belongs to class 1 and thus does not represent a risk for those who use it correctly. Intrabeam Viewing: all the viewing conditions whereby the eye is exposed to all or part of a direct laser beam or a specular reflection; it does not include the viewing of diffuse reflection. LASER: any device which can be made to produce or amplify electromagnetic radiation in the wavelength range included between 180 nm and 1 mm, primarily by the process of controlled stimulated emission. LASER Controlled Area - LCA: an area where the occupancy and activity of those within is subject to control and supervision for the purpose of protection from radiation hazards. Usually, in the Laser Controlled Area the optical radiation exceeds the exposure limits and within it wearing protective devices could be mandatory. The Laser Controlled Area is delimited by physical guards, such as the walls of the room where the LASER is used or the housing of the device. LASER product: any device or set of components that represents, embeds or is designed to embed a LASER or a LASER system. LASER radiation: any electromagnetic radiation emitted by a LASER device, which is included in the wavelength range 180 nm-1 mm, produced as a consequence of a stimulated emission. 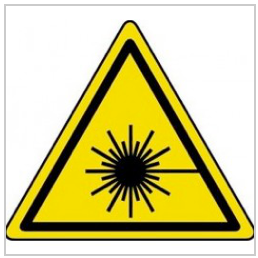 LASER Safety Officer: (industrial setting) one who has the knowledge required to evaluate and control the laser hazards and who is responsible to monitor them. Maximum Permissible Exposure - MPE: the level of laser radiation to which a person, under normal conditions, may be exposed without hazardous effect. MPE levels represent the maximum level to which the eye or the skin can be exposed without suffering a short or long term damage; these levels depend on the wavelength of the LASER radiation, the duration of the pulse or of the exposure and on the type of the exposed tissue. Nominal Ocular Hazard Distance - NOHD: distance from the emission aperture at which the irradiation or the energy exposure of the beam becomes equal to the Maximum Permissible Exposure (MPE) for the cornea. Anyone being at a distance from the source lower that the NOHD shall wear the appropriate personal eye-protection equipment. Nominal Ocular Hazard Area - NOHA: space within which the level of the irradiation or the energetic exposure of the beam exceeds the MPE for the cornea; it includes the possibility of an erroneous and accidental pointing of the LASER beam. Inside the Nominal ocular hazard area it is mandatory to wear appropriate personal eye-protection equipment. Optical component on the beam path: optical component found on the path defined by the beam (e.g. focusing lens). Protective housing: physical enclosure to prevent human exposure to the LASER radiation, unless the access to radiation is necessary for the operations foreseen by the manufacturer. Remote Interlock Connector: connector which allows the connection to external commands which are located at a distance from the other components of the LASER device. Safety interlock: automatic device, associated with a LASER guard, with the purpose of preventing human access to Class 3A, Class 3B or Class 4 LASER radiation, when this guard is removed, opened or displaced. Under some given conditions the entry doors to the Laser Controlled Area of a Class 4 LASER are connected to interlocks, in such a way that if they are opened by mistake the LASER emission is automatically interrupted in order to prevent an exposures over the limit values for anyone entering the room.